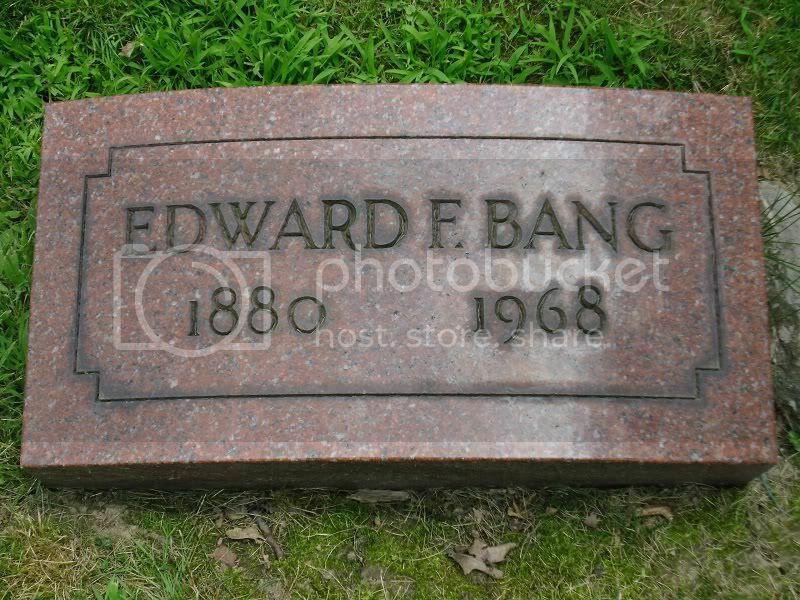 Died: June 30, 1885, St. Louis, MO, age 37,---Buried: Catholic Cavalry Cemetery, ST. Louis, MO on July 2, 1885. Arrived in St. Louis (from Quebec, Canada), in 1863. One of first baseball writers in Midwest. Cincinnati telegrapher, left Western Union telegraph company to work Cincinnati Gazette & then went St. Louis, Missouri Democrat. When Globe merged with Democrat, took over as telegraph editor. Expert telegrapher and was in charge of the telegraph office at the House of Parliament probably about 1860. During spare time, developed sports page for Globe-Democrat. Covered all sports and was regared as one of top writers of his day, due to his versatility. Billy Spink was an expert baseball player in the 1860's. He could play all the positions. He also caught, up close to the batsman, without aid of mask, gloves or chest protector. Father: William Spink b. Dundee in 1815, d. Pt. Louis, Quebec 1867; emigrated to Pt. Louis, Quebec, settled on Isl. Orleans & later to Montreal. He was a member of Quebec Legislative Assembly. Married Francis Ann Snaith (b: 9 NOV 1820 in Montreal, Quebec) at Episcopal Cathedral in Montreal, 1841. 8 children - 4 boys/4 girls. Last edited by Bill Burgess; 07-20-2013, 11:04 AM. St. Louis World, sports editor, 1902-? His family were from Quebec, Canada. After the Civil War, the family moved to Chicago, IL. In 1875, Al moved to St. Louis, MO, and became a great fan of the St. Louis Stockings. Sports editor of 3 St. Louis newspapers; Globe-Democrat, Missouri Republican, Post-Dispatch. 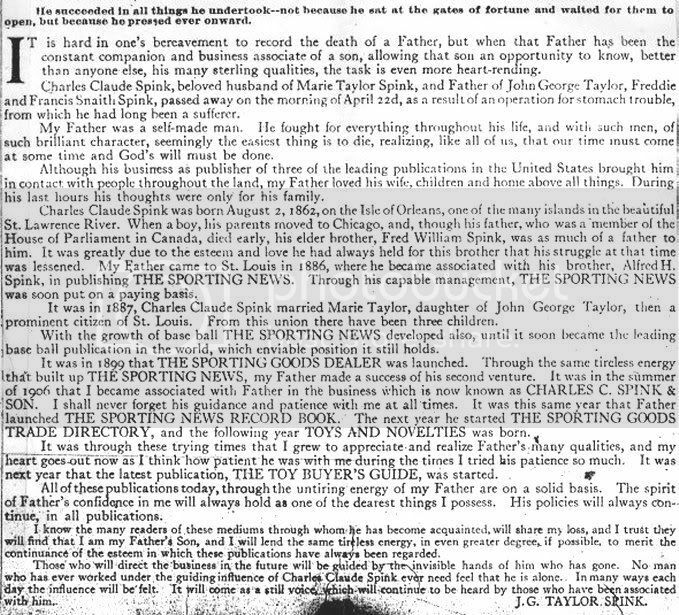 Founded The Sporting News on March 17, 1886. Called brother Charles to St. Louis from South Dakota in the late 1880's to be business manager of Sporting News. He gradually lost his interest in the publication, and in 1896, sold all his stock to his brother, Charles, who had been functioning as the publication's business manager, thereby turning the Sporting News over to him. 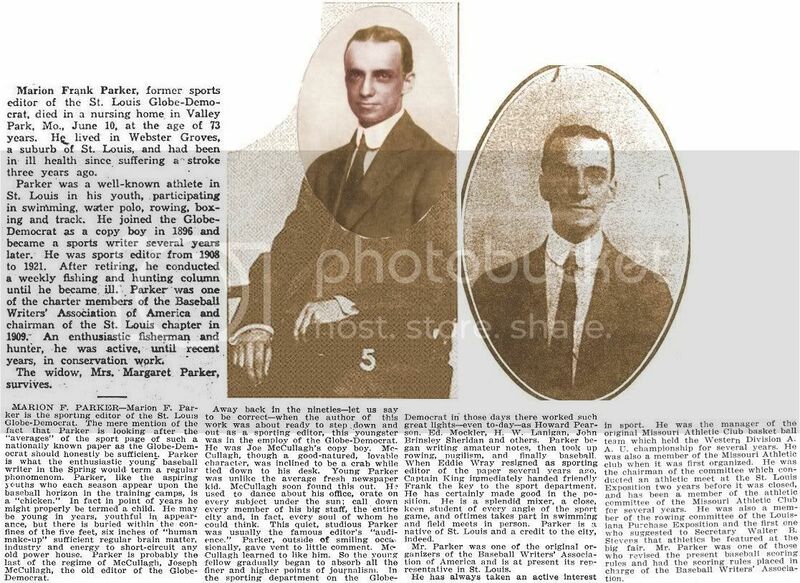 1st President of Western League, started a number of ball clubs & leagues before launching The Sporting News. Authored several books. Edited Reach Guide, 1888. 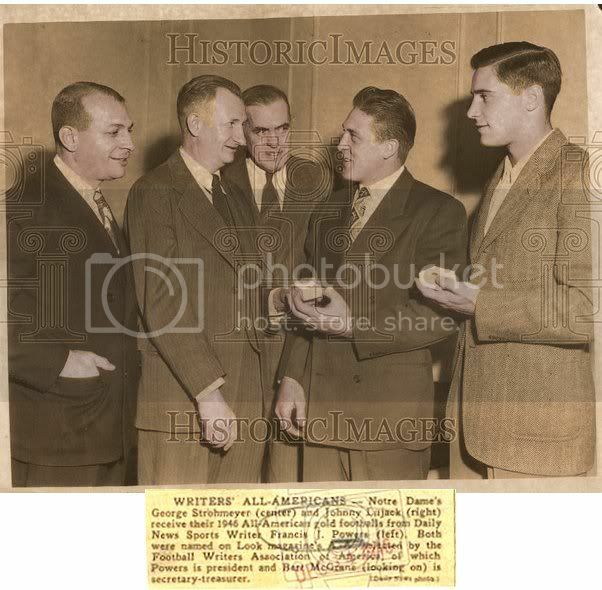 Press agent of Chris Von der Ahe, interested him in baseball. Spink Sport Stories: 1000 Big and Little Ones, Volume 1, 1921. -------------------------------------------------------------------------------New York Times' obituary, March 28, 1828, pp. 25, column 3.--------------1910. 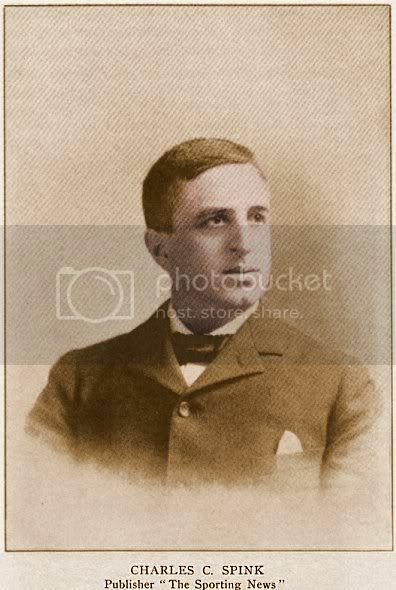 Alfred Henry Spink (August 24, 1854 – May 27, 1928) was a Canadian-born American baseball writer and club organizer based mainly in St. Louis, Missouri. In 1886 he established a weekly newspaper, The Sporting News (TSN), that emerged from World War I as the only national baseball newspaper or magazine. Born in the city of Quebec, Canada, Al Spink and his two brothers learned baseball's English cousin, cricket. The family of ten moved to Chicago after the American Civil War and the boys moved to baseball, whose boom was continental in scope. In 1869 or 1870, the Spinks founded the amateur Mutual club on the West Side, named after the professional Mutuals of New York. Probably there were dozens of amateur clubs in Chicago beside the professional White Stockings. Older brother Billy (William C.) became sporting editor of the St. Louis Globe-Democrat and persuaded Al to move to that city in 1875, where he was soon covering baseball for the Missouri, later St. Louis Republican. The city's first fully professional baseball team, the original St. Louis Brown Stockings were then in operation, contesting the championship of the U.S. in the National Association and then the National League. 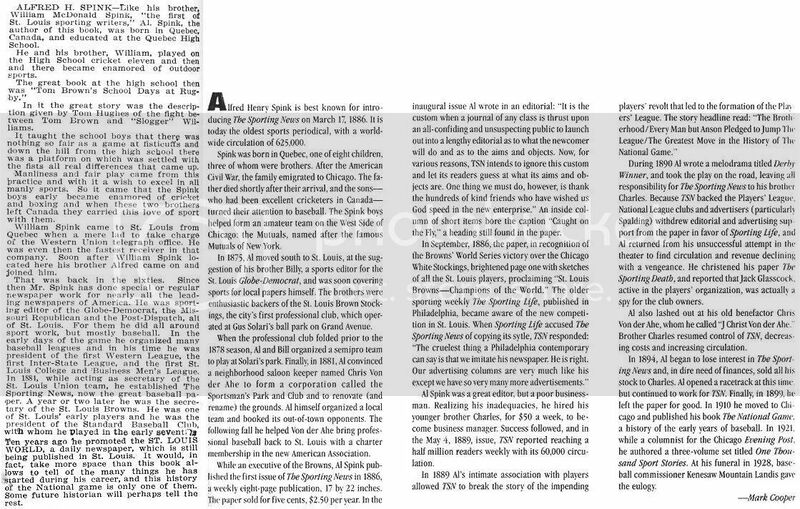 Not long after the Browns went out of business in December 1877, the Spink brothers began thinking about how to restore professional baseball in their city. Unfortunately, spectator interest in the game had been damaged by the scandal that persuaded the Browns to drop out, and they struggled to organize a team of former pros playing cooperatively. Al Spink helped turn the trick in 1881, establishing the Sportsman's Park and Club Association with Chris von der Ahe, whose first work was to acquire and renovate the old Grand Avenue ballpark (as Sportsman's Park). 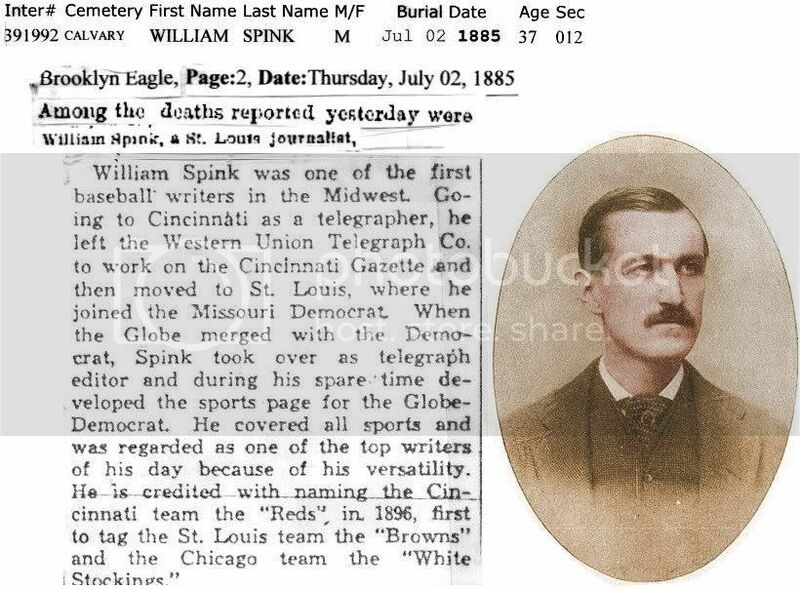 Spink organized a new Brown Stockings team and booked games with other western teams, especially one organized by Cincinnati baseball writer O.P. Caylor and billed as the Cincinnati Red Stockings. The success of independent commercial baseball in 1881, especially in St. Louis, inspired organization of the American Association league for 1882, with Sportsman's Park and Club its member from St. Louis. The writers Spink and Caylor remained influential although the clubs were owned by men of "greater substance". Al Spink founded The Sporting News in winter 1886. Each number was 17 by 22 inches, eight pages, price five cents (Cooper 1996). The leading baseball newspapers were then based in the East, the weeklies Clipper and Sporting Life in New York and Philadelphia. By World War I, TSN would be the only national baseball newspaper. 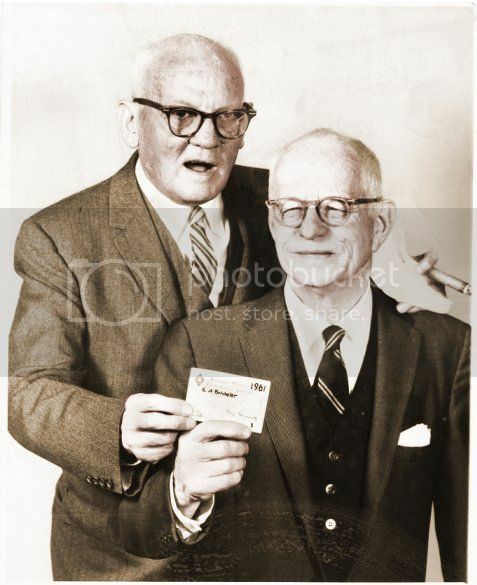 Al Spink had long turned it over to his younger brother Charles, hiring Charles as business manager in the 1880s, selling his stock in 1894, and finally departing from writing and editorial work in 1899 (Cooper 1996). Some time after leaving TSN, Al moved to Chicago where he would eventually write for the Evening Post. 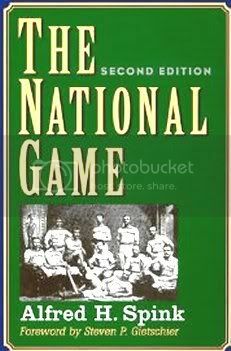 In 1910, revised in 1911, he published one of the first baseball histories, The National Game. One section organized by city is full of detail on early amateur and independent organizations and players, including 20 pages for his adopted city, "The Game in St. Louis". Another section consists of short entries on more than one hundred baseball writers with dozens of portrait photos. The sections on players organized by fielding position are not unique, but they remain a treasure trove because Spink did not focus exclusively on major league players or major league spans of careers. 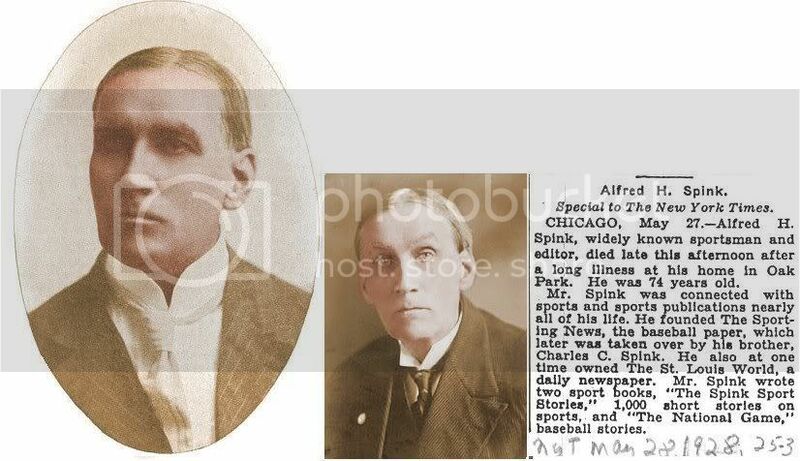 Spink died 1928 in Oak Park, Illinois, almost 74 years old. Last edited by Bill Burgess; 08-25-2011, 04:44 PM. Died: April 22, 1914, St. Louis, MO, age 51, died after an operation for an intestinal problem. His brother Al founded the Sporting News in St. Louis on March 17, 1886. When his brother Al called him in South Dakota in 1886, he came to St. Louis to assume business management duties for The Sporting News. Al started to lose his interest in the publication in 1892, and in 1896, sold all his stock to him, thereby turning The Sporting News over to him. Al started a horse race track, but continued to work for The Sporting News until 1899, when he left the publication permanently. Charles was an indefatigable and powerful workhorse, who built up the newspaper until his death in 1914. Moved to St. Louis in 1886. Married Marie Taylor, daughter of John George Taylor, in 1887. ------------Taylor's Loving Tribute of a grateful son. ----A heartfelt tribute from his brother, Al. Last edited by Bill Burgess; 07-20-2013, 11:09 AM. Died: March 26, 1992, St. Louis, MO, age 75,---d. of an embolism. Published the Sporting News, December 7, 1962 to January 11, 1977. He was elected president-treasurer on October 22, 1962. After the sale of TSN on January 11, 1977, the terms of the sale included that he was required to remain as publisher for 5 years, and an additional 5 years as consultant. He finally retired January, 1987. Johnson was named after Ban Johnson, first President of the American League. It reflected the warm, life-long friendship between his father, Taylor Spink and Johnson. The Sporting News started as a mulit-sports newspaper, but by around 1900, baseball had squeezed out all other sports. But that policy ended September 17, 1942, when it started to include football, college basketball and professional hockey. Upon the death of J.G. 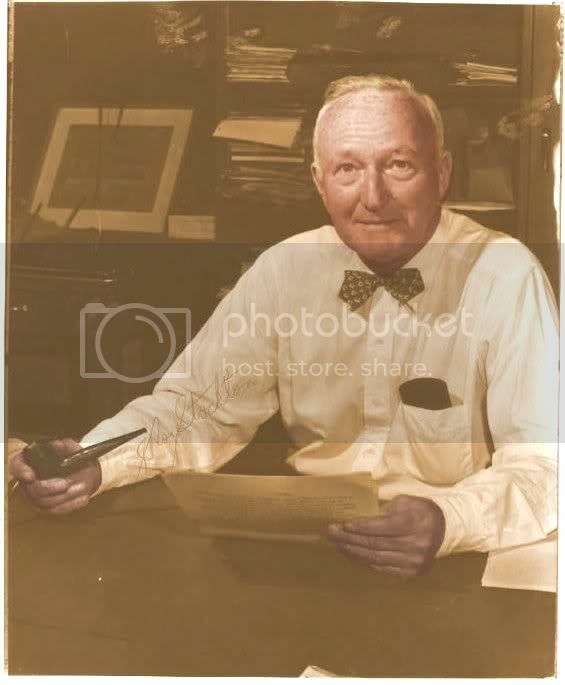 Taylor Spink, The Sporting News of St. Louis, MO was inherited by Charles Claude (CC) Johnson Spink who ran it from Dececmber 7, 1962 until he sold it in January 11, 1977, to the Times Mirror Corporation for $18m. He did a respectable, credible job, but was not in the same league as his two immediate predecessors, who had been inexhaustible, relentless powerhouse perfectionists. When Johnson Spink inherited the Sporting News, its circulation was over 178,000. When he left in January, 1982, it was up over 600,000. So, he wasn't a bad steward at all. But it is worth noting that after his time, the circulation went up to 770,000, and once, in September, 1985, it even hit 927,500. So, it had potential that Johnson was not able to milk. In the 1970's and 1980's, Johnson Spink authorized a massive increase in the number of obituaries. Some issues had a complete page of them. 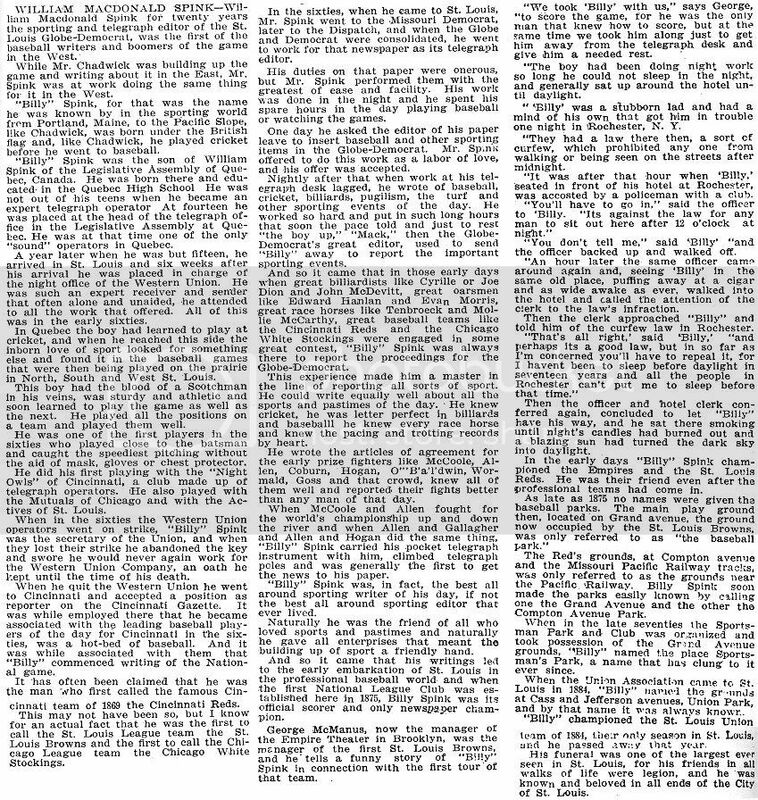 But by May 6, 1991, after the Spink era was long ended, the obituaries in TSN had virtually disappeared from its pages. It ran an occasional, random obit, but the era of having an obit section was long gone. An editorial decision by its later owners. With the advent of national sports media in the 1980s such as USA Today and ESPN, and of comprehensive web sites run by the major sports leagues in the 1990s, TSN lost this unique role as the only national baseball vehicle. Consequently, it evolved into more of a conventional, glossy sports magazine in both appearance and contents. Box scores disappeared from its pages in the late 1980s, but were still made available to subscribers in a separate publication for an undetermined period of time afterwards. The online SN Today revived the tradition of publishing boxscores in its virtual pages. By 1990, it discontinued its extensive obituaries pages. In 1996, it incorporated 4 color photos. In 2001, the company acquired the One on One Sports radio network, renaming it Sporting News Radio. The same year, it was purchased by Paul Allen's Vulcan Inc. In September 2006, American City Business Journals, Inc. acquired TSN and its online division. With the change in ownership, the company ceased most of its book publishing efforts. The 2006 Baseball Guide, a TSN annual in one form or another since the 1920s, was its last. The 2007 Baseball Register, an annual since the early 1940s, was its last. The 2007 Baseball Record Book was only available online, as a download. None of these guides were published in 2008. By 2000, it sold around 520,000 copies every week, and by 2008 was up to 700,000 issues a week. It is an important publication, but no longer stands out from its competition. 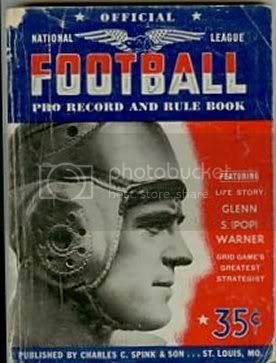 It requires its box-scores, obituaries' section & interviews from former players to give it its former historical relevance, uniqueness, continuity & context. He was the son of J.G. Taylor Spink; grandson of Charles Spink; great nephew of Al Spink and second cousin of Ernest Lanigan. January 28, 1962, NY: L-R: Gil Hodges, Roger Maris, Johnson Spink, Whitey Ford, Mickey Mantle. They all hold awards received at the New York sports writers' annual dinner. ---------------------------------------------------------------------------------With uncle Taylor and his mother. Last edited by Bill Burgess; 07-31-2012, 02:06 PM. St. Louis Post-Dispatch, 1896 - ? Missouri Committee on Public Utility Information manager, 1921 - ? While on Committee, he blew the whistle on some corrupt practices, and then tendered his resignation. Shortly thereafter he suffered nervous disorders, and received professional care in sanitarium. 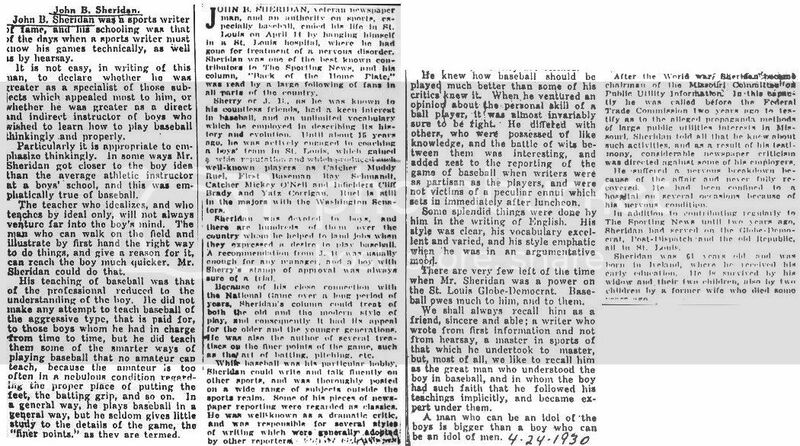 Sherry's column for Sporting News "Back of Home Plate", 1917-29, gained for him national respect as a baseball writer. He also wrote with authority on boxing, golf, and most sports. Personally, I suspect that his physical problems, which started soon after he exposed government corruption, was a result of sabotage. I also suspect his so-called "suicide" may have been an unsuspected homicide. He was found hanging in his room at Alexian Brothers Hospital, by a bathrobe cord. 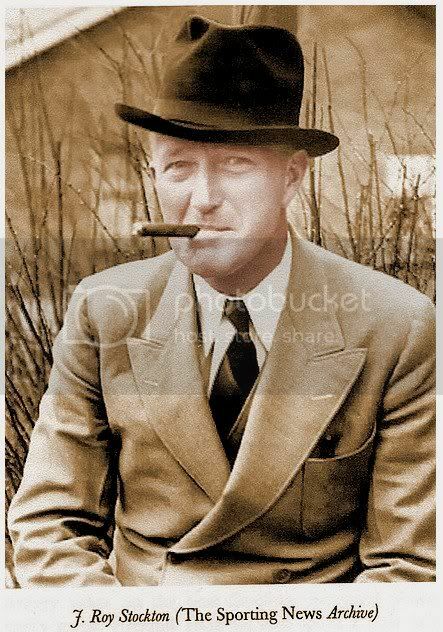 ---April 24, 1930, pp. 4, col. 2.-------------April 24, 1930, pp. 4, col. 7. Last edited by Bill Burgess; 01-27-2013, 06:02 PM. 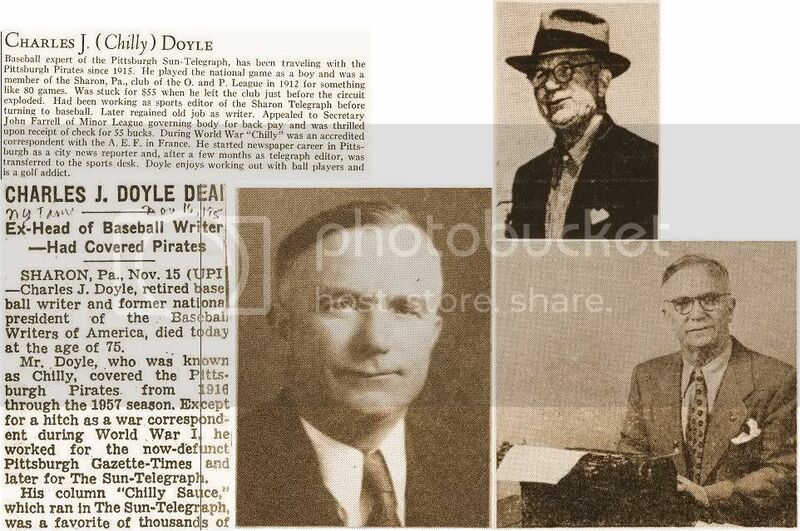 Moved to Pittsburgh, 1914, began covering Pirates in 1915. Served WW1 in France as Pittsburgh Gazette-Times correspondent. New York Times' obituary, November 16, 1959, pp. 31. 1955: Chilly Doyle / Stan Musial. 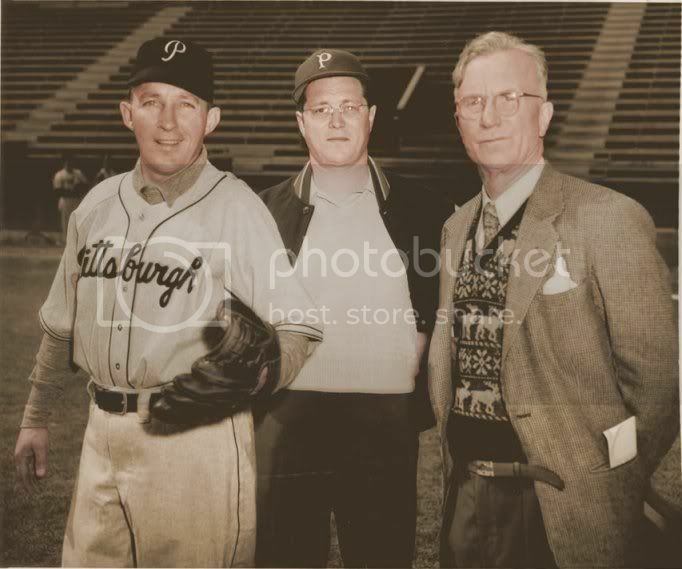 April 18, 1958, Pittsburgh, PA: L-R: Les Biederman, Chilly Doyle, Max Unger (jeweler), Harry Keck.----------------------------------Bing Crosby, Dr. Allen Tanney, Chilly Doyle. Last edited by Bill Burgess; 08-23-2012, 02:05 PM. 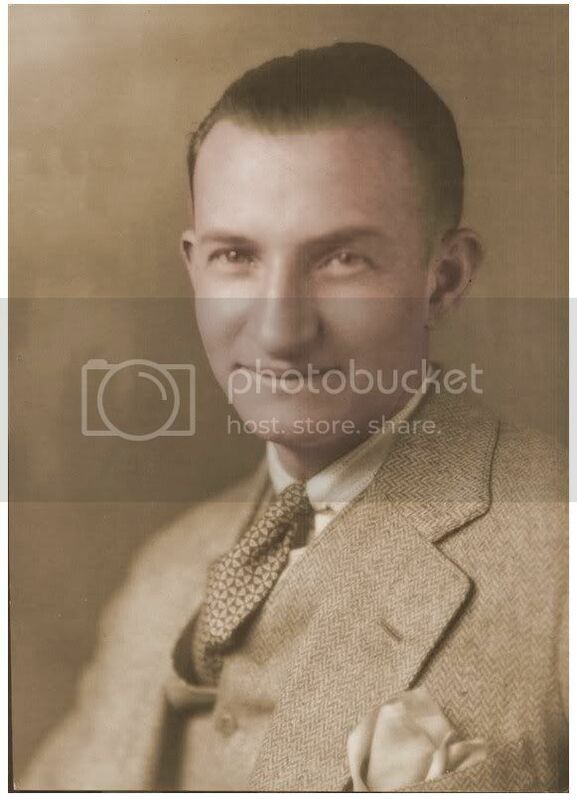 Detroit News, sports editor his whole career (1907-58). Was Ty Cobb's biggest booster in print. Edited Major League Baseball: Facts and Figures and Official Rules, 1941 -1950, along with Harry Heilmann & Don H. Black. The recipient of the 1968 J.G. 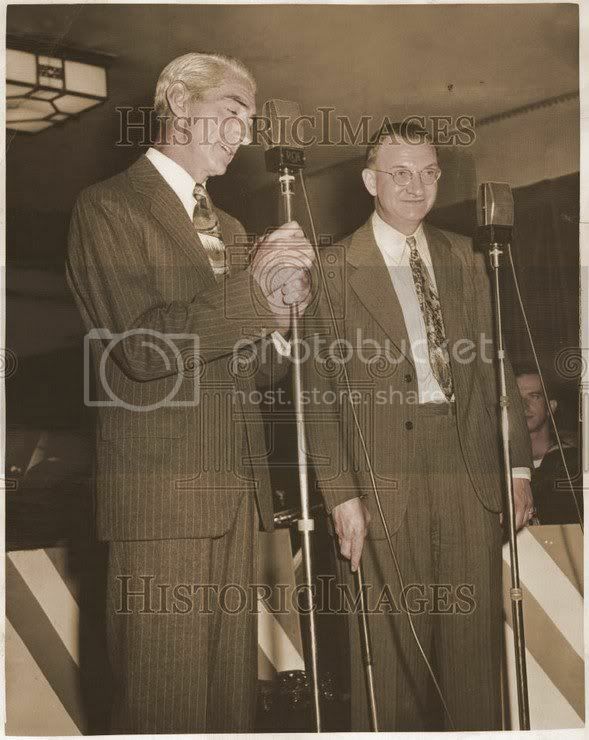 Taylor Spink Award was Harry G. Salsinger. Born in Springfield, Ohio, in 1887, Harry Salsinger worked in his hometown, Dayton, and Cincinnati, before joining the Detroit News at the age of 20. Sal, as his close friends called him, remained with the Motor City newspaper for over 50 years, following the exploits of Tiger ballplayers from Ty Cobb to Al Kaline. For all but two years of his career at the Detroit News, Salsinger held the position of sports editor. 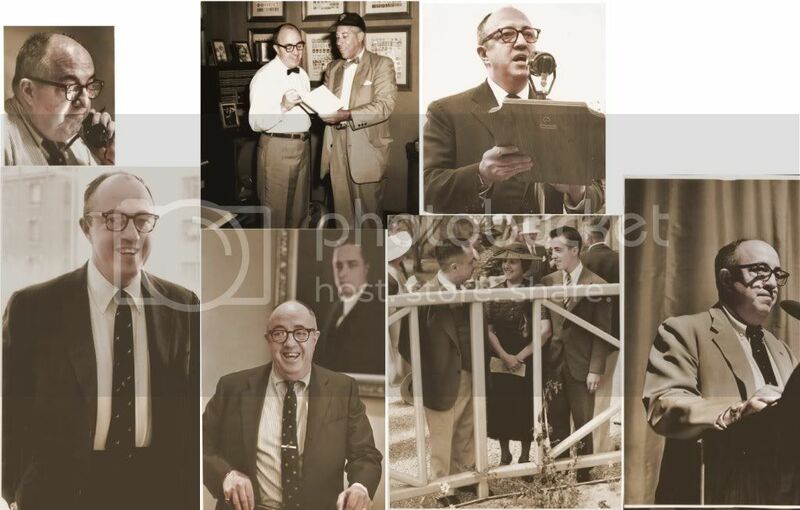 A former president of the Baseball Writers' Association of America, Salsinger was well-versed in many sports, but his forte was unquestionably baseball. His column was titled simply "The Umpire." The byline of Salsinger meant solid, factual writing in an interesting style. Westbrook Pegler called Salsinger "the best sportswriter in the country." Bob Broeg recalled that Salsinger was "a dignified man who brought figurative as well as actual stature into the profession." 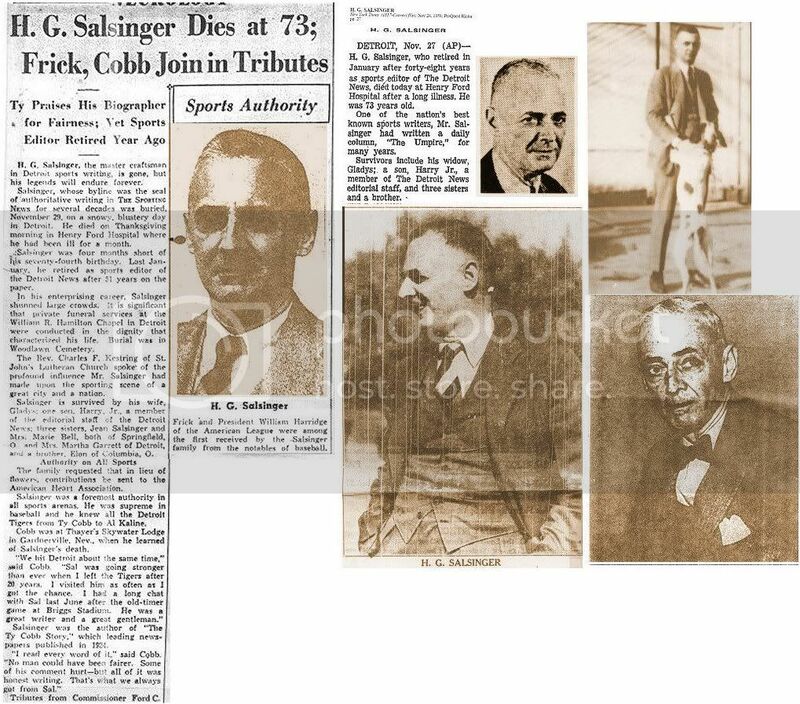 Salsinger died at the age of 71 on Thanksgiving Day, 1958. Harry's photo/entry in Who's Who in Major League Baseball, edited by Harold (Speed) Johnson, 1933, pp. 510. Sporting News' obituary, December 10, 1958, pp. 24, col. 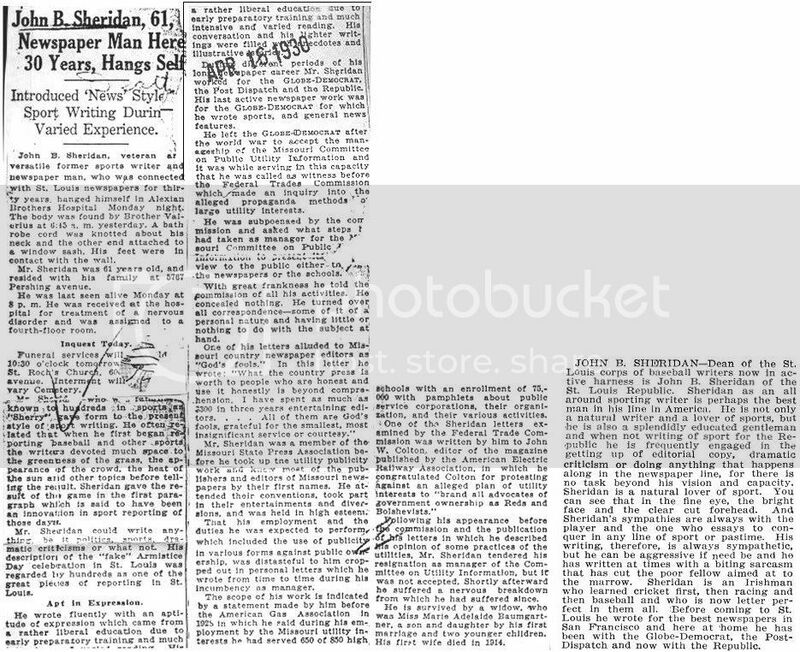 1.---------------------------New York Times' obituary, November 28, 1958, pp. 27. Last edited by Bill Burgess; 02-07-2012, 11:35 AM. Moved from Youngston, OH to Cleveland in 1907. 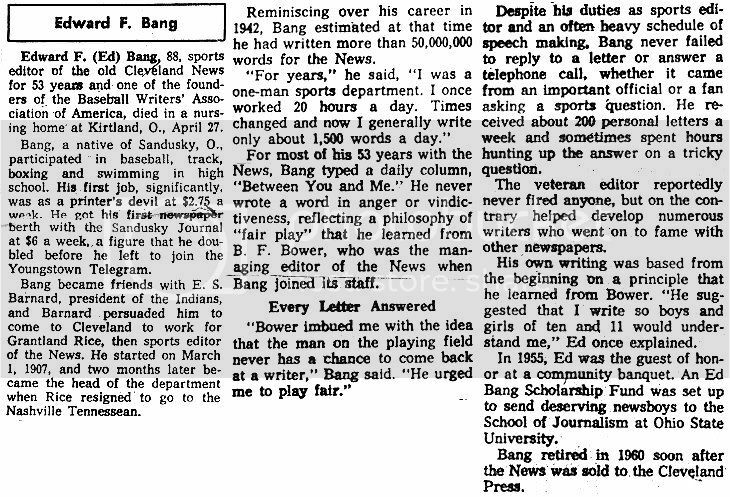 Cleveland News sports editor, 1907 - 1960; His column was entitled, "Between You and Me." Liked to bet the horses, play golf. His son became known sports writer. GetImage3.pdf: Sporting News' 1939 Interview. edited by Harold (Speed) Johnson, 1933, pp. 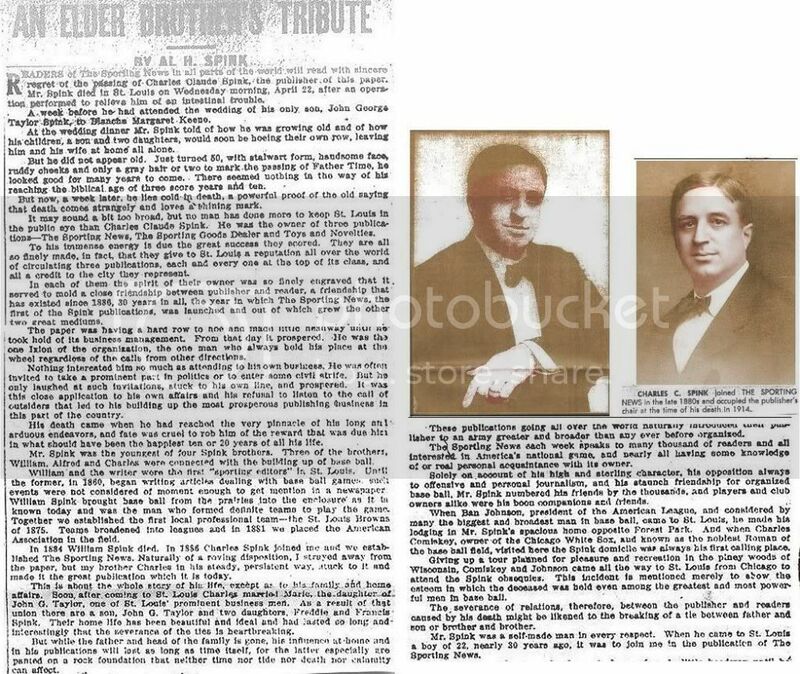 494.-----------------Chicago Tribune obituary, April 29, 1968, pp. A8. July 8, 1935, All-Star Game, Cleveland, OH. 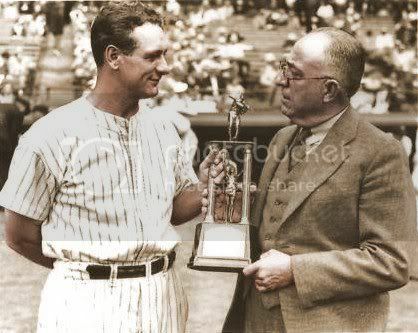 Ed Bang Presents 1934 MVP Trophy to Lou Gehrig in a brief ceremony before the start of the All-Star Gme. Sporting News' obituary, May 11, 1968, pp. 38. July 19, 1934: Visiting Babe Ruth in a Cleveland hospital, with Babe's wife, Clair. Last edited by Bill Burgess; 03-29-2014, 12:30 PM. St. Louis Republic sports department; Began as a reporter in 1912. St. Louis Post-Dispatch, 1917-25, golf / general sports; Changed to BB in 1926-58, covered all Cardinal games & World Series. Sports editor, April, 1946 - July, 1958. Had evening sports program on radio station KSK for 15 years. 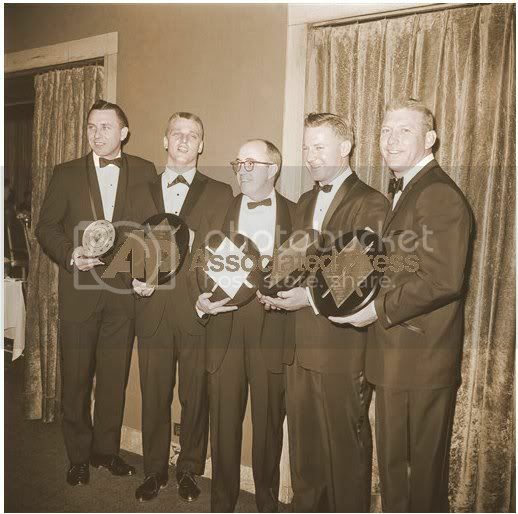 J. Roy Stockton, Dan Daniel, and Fred Lieb were the recipients of the 1972 J.G. Taylor Spink Award. 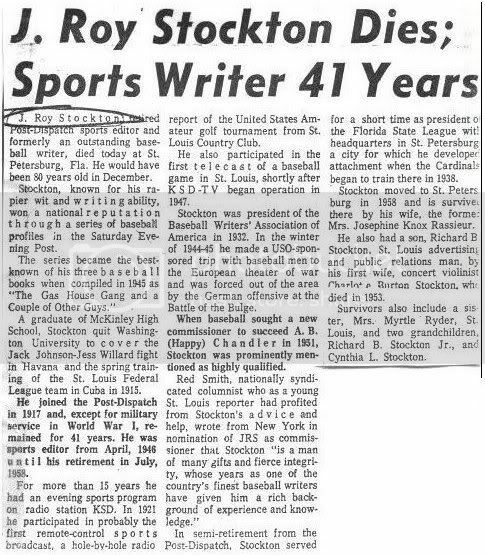 Long-time baseball writer J. Roy Stockton first entered the world of sportswriting when he covered spring training for the 1915 St. Louis Federal League baseball club in Cuba. 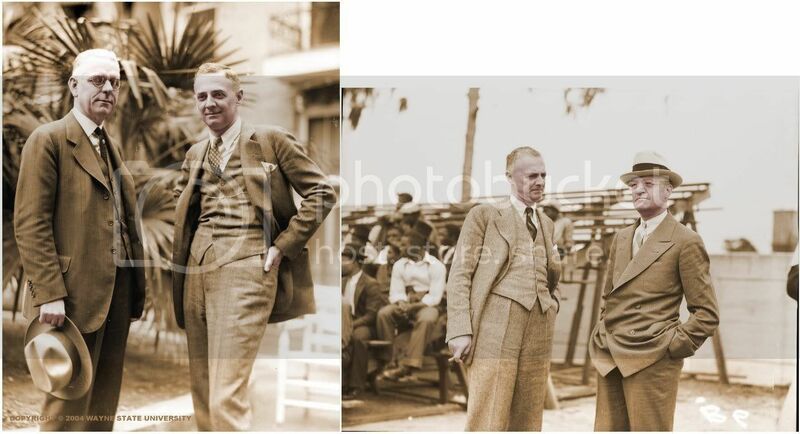 While in Havana, he also reported on the upset victory of Jess Willard over Jack Johnson. At the age of 25, Stockton hired on at the St. Louis Post-Dispatch where he remained for over 40 years. 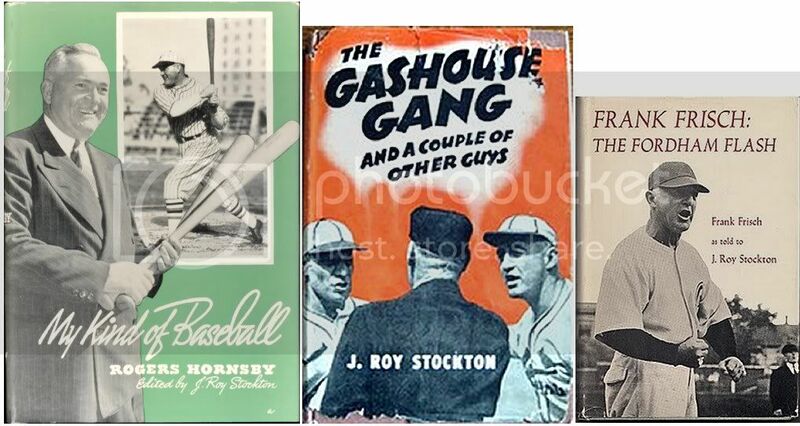 The witty Stockton was author of the baseball classic The Gas House Gang and a Couple of Other Guys, but his journalistic career was not confined to the written word. For over 15 years Stockton hosted a radio sports program and was part of the first telecast of a baseball game in St. Louis in 1947. 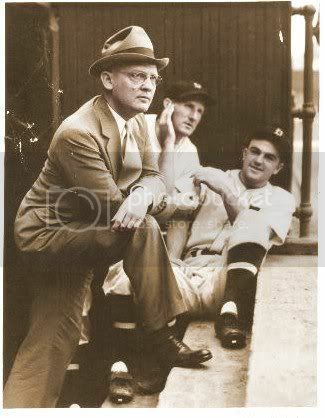 In nominating Stockton for Commissioner of Baseball, a position that eventually went to Ford Frick, Red Smith referred to Stockton as "a man of many gifts and fierce integrity, whose years as one of the country's finest baseball writers have given him a rich background of experience and knowledge." A former president of the Baseball Writers' Association of America, Stockton also served briefly as president of the Florida State League. Last edited by Bill Burgess; 11-13-2011, 08:28 PM. Died: November 19, 1978, Forest Park, IL, age 84,---d. at his Forrest Park home, late on a Sunday night. Chicago Today, 1967 - 1974. Chairman Hall of Fame Veterans Committee. Author of columns, including "So They Tell Me" and "Down Memory Lane." Wife: Mary Olive Burns, born California, around 1893, died July 9, 1967, Chicago, IL; Son: Roger L., born February 5, 1928, Oak Park, IL, died January 31, 2002; Son: Warren William, Jr., born San Francisco, CA, around 1924; Son: Peter J., born San Francisco, CA around 1927; Daughter: Mary Elizabeth Rempe, born California, February 27, 1919, died November 27, 2000; Warren married Mary August 23, 1919. Warren was more than a baseball writer. He was also considered an expert in football, boxing and horse racing. Mr. Brown was one of the earliest writers to laud the coming greatness of Red Grange. 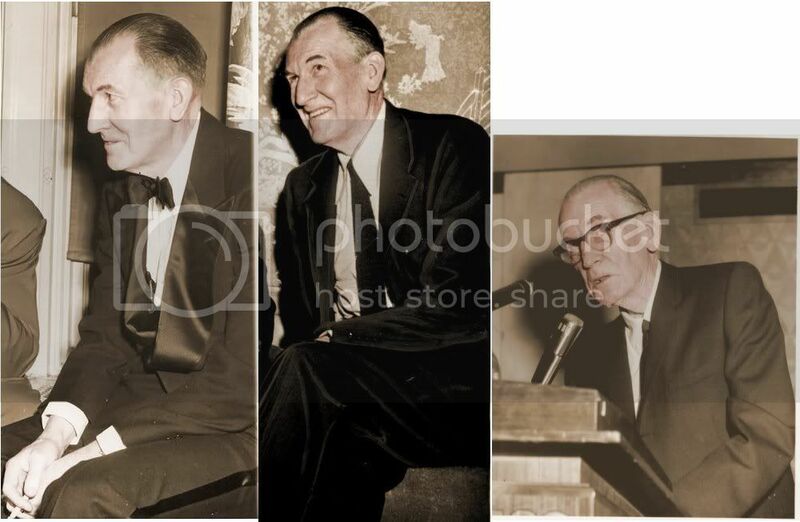 Warren Brown, John Drebinger, and John F. Kieran were the recipients of the 1973 J.G. Taylor Spink Award. For more than half a century, Warren Brown consistently gave composition and expertise to sports pages across the country. A graduate of St. Ignatius College (now the University of San Francisco) where he starred playing baseball, Brown joined the San Francisco Bulletin in 1916. In 1922, following his service in World War I, Brown moved to New York. The next year he was appointed sports editor of Hearst's Chicago Herald-Examiner. Brown later became the first sports editor of Marshall Field's Sun in 1941 and was a columnist for the Chicago American (later Chicago Today). A tall, spare figure, Brown brought to the typewriter the same sharp, biting wit that made him famous as master of ceremonies in the after-dinner circuit. The man who was responsible for nicknaming Red Grange "The Galloping Ghost," Brown wrote books about the Cubs and White Sox. Starting in 1920, Brown saw every World Series for fifty years. Both a daily columnist and a working assignment man, Brown's witty and humorous remarks are still retold in the press box. Biography Resource Center: Contemporary Authors Online, Thomson Gale, 2005. 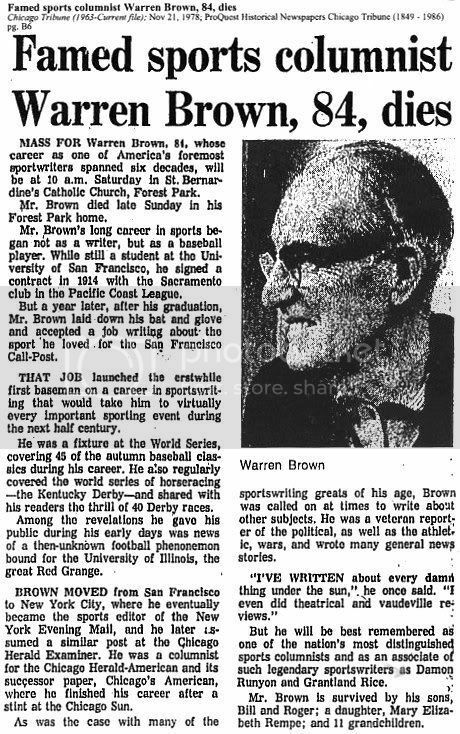 Warren Brown was considered one of the top sports writers and editors of the twentieth century, his lengthy career covering forty-five World Series and forty Kentucky Derbies. 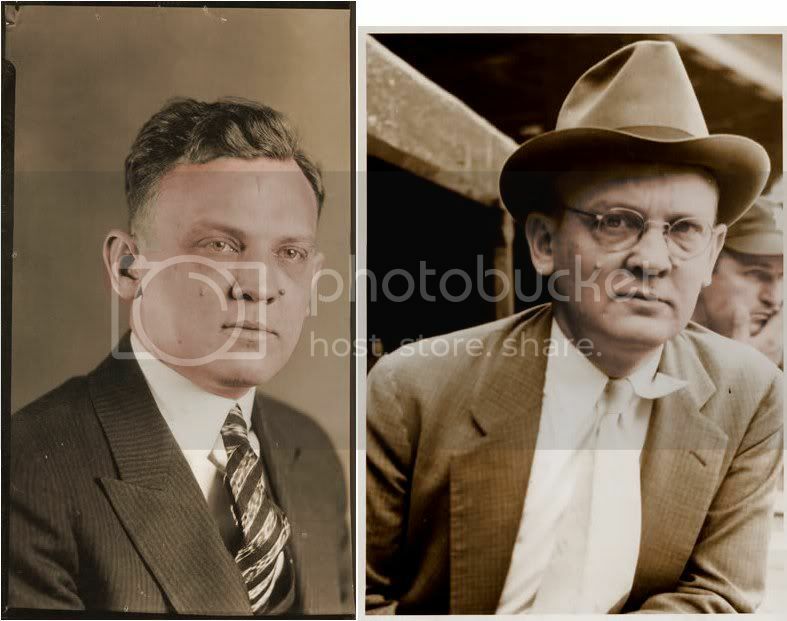 Beginning his journalism career in 1916, he proved himself to be a versatile and prolific newsman, skillfully covering hard news as well as the sports stories that made his reputation. Brown was well-educated and noted for his "exceptional mastery of the English language, his encyclopedic memory, and his razor-sharp wit. He excelled at coining memorable phrases, whether behind a typewriter or behind a podium, and in either venue his humor could be sarcastic or benign--as easily capable of deflating as well as inflating," remarked Richard Brodenker in Dictionary of Literary Biography. Brown was born in California and grew up in San Francisco. He developed a strong interest in sports performers, both contemporary and historical. Baseball and prizefighting, two of his favorite sports, were flourishing in San Francisco at that time, providing him with many heroes. He progressed so rapidly in his studies that at the age of eleven he was sent to high school. He was athletic as well as studious, playing baseball in college and eventually starting as a professional player with Sacramento's team in the Pacific Coast League. In his first appearance for Sacramento as a pinch hitter, Brown hit safely off former Chicago White Sox pitching star Doc White. Despite this and other thrilling moments, he returned to college at the conclusion of the 1914 season. 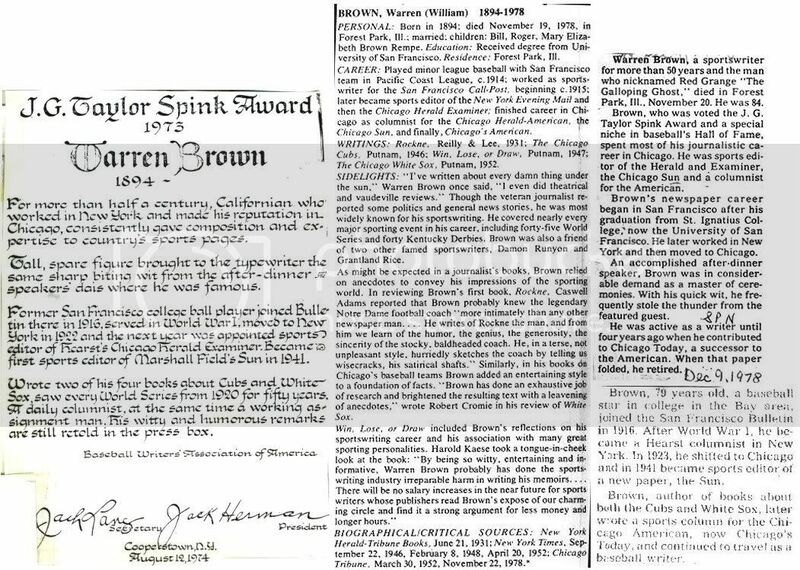 After graduation, Brown worked part-time at the San Francisco Bulletin, earning five dollars a week writing notes on semiprofessional baseball. He was soon publishing stories with his own byline, and his career was launched. After serving in World War I, he returned to the Bulletin but soon was employed at William Randolph Hearst's San Francisco Call-Post, where he became the sports editor while still in his early twenties. He later worked again for the Bulletin, where he was the first writer to predict that Jack Dempsey would take the heavyweight crown from Jess Willard. Besides his sports coverage, Brown also wrote reviews of musical and vaudeville performances and assisted in covering news stories ranging from political conventions to murder trials. 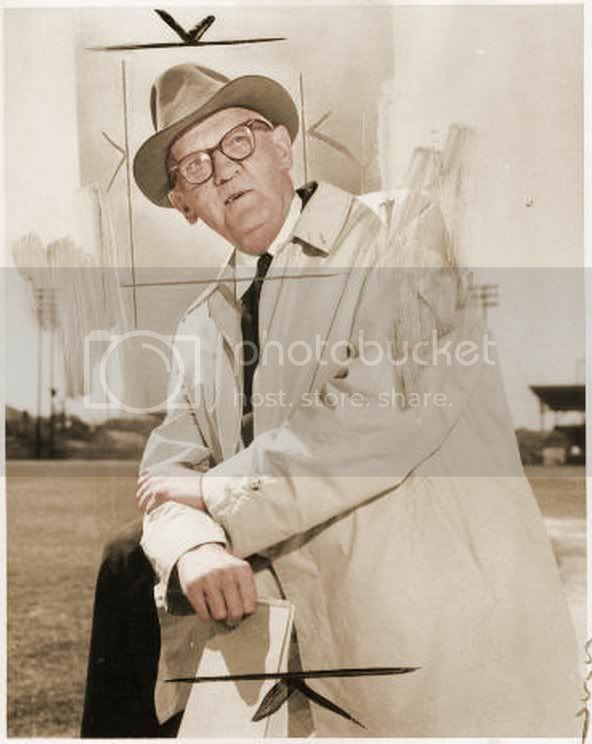 He proved his adeptness at investigative reporting when he and fellow journalist Edward T. Gleeson uncovered some wrongdoings in the Pacific Coast League and published their findings. Eventually the league's president and several team owners were replaced. Working in California at that time, Brown could hardly fail to be immersed in the so-called "Hearst style," which Brodenker noted can be "identified by trick idiom, beautiful phrasing, and vivid imagery. Brown, however, held steadfastly to the concept of simplicity." Brown's knowledge of boxing and his admiration of Jack Dempsey provided another career opportunity in 1921, when he took on the task of supervising the champion's press relations prior to a bout with Georges Carpentier. The job led him to Atlantic City on the East Coast. Though he returned to San Francisco in 1922, he had his sights set on a writing position for a New York paper, and it was not long before he had secured a position with the New York Evening Mail. 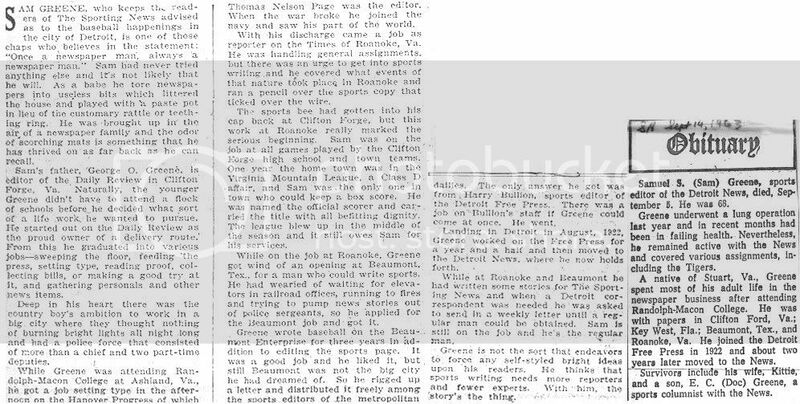 Brown was now working in the same city as legendary sportswriters such as Heywood Broun, Damon Runyon, Grantland Rice, and Ring Lardner. He soon moved to the Hearst-owned New York Journal, but in 1923 the Hearst organization transferred him to the Chicago Herald and Examiner. By 1926 he had a column running six times a week in the paper, titled "So They Tell Me," which focused on a variety of sports performers, athletic competitions, sport oddities, and general human-interest items. In the Midwest, one of Brown's loves was collegiate football, especially the teams of Notre Dame and the University of Illinois. There he became familiar with such legendary figures as coach Knute Rockne and halfback Red Grange, whom Brown nicknamed the "Galloping Ghost." Brown's friendship with Rockne led to his first book. 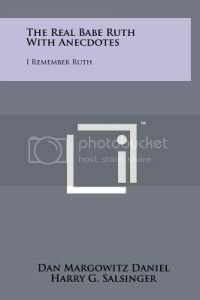 Published in 1931, Rockne is a flattering autobiography of the football coach, who had died in a plane crash earlier that year. In the foreword to Brown's book, Notre Dame president Reverend Charles L. O'Donnell praised Brown, noting that his sketches provide a truthful portrait of Rockne. This sentiment was echoed by Casswell Adams, who stated in his New York Herald-Tribune Books review: "He writes of Rockne the man, and from him we learn of the humor, the genius, the generosity, the sincerity of the stocky, baldheaded coach. He, in a terse, not unpleasant style, hurriedly sketches the coach by telling us wisecracks, his satirical shafts." In this and other books, as in his shorter pieces, his work is typically "precise, insightful, and, at any given moment, witty, funny, angry, or scathing." 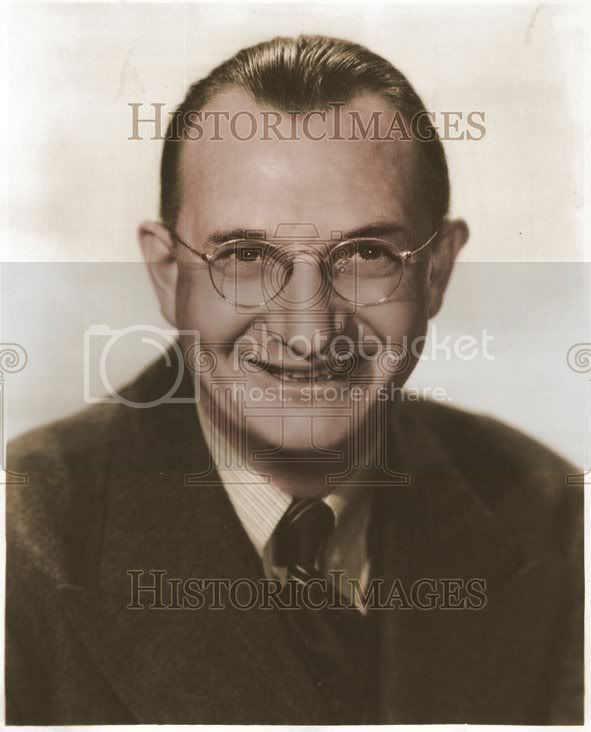 Brown continued to work for the Hearst corporation during the 1930s and into the 1940s, but signed on to Marshall Field's Chicago Sun early in the decade, taking his "So They Tell Me" column with him. He stayed with the Sun until 1946, when he returned to the Hearst organization. In 1947, he published Win, Lose, or Draw, which included Brown's reflections on his sportswriting career and his association with many great sporting personalities. New York Times critic Harold Kaese took a tongue-in-cheek look at the book: "By being so witty, entertaining and informative, Warren probably has done the sportswriting industry irreparable harm in writing his memoirs.... There will be no salary increases in the near future for sports writers whose publishers read Brown's expose of our charming circle and find it a strong argument for less money and longer hours." Brown also had a long-standing sideline as an after-dinner speaker, which developed into regular guest appearances on Bing Crosby's nationally-broadcast network radio program, and occasional spots on other popular shows. He even wrote some of his own material for these programs. He also became active in working with the National Baseball Hall of Fame. His career stretched on for more than five decades, and he continued to write well into his senior years. At the age of seventy-eight, he contributed a column, "Down Memory Lane," to Baseball Digest magazine. Brown relied on anecdotes to convey his impressions of the sporting world. 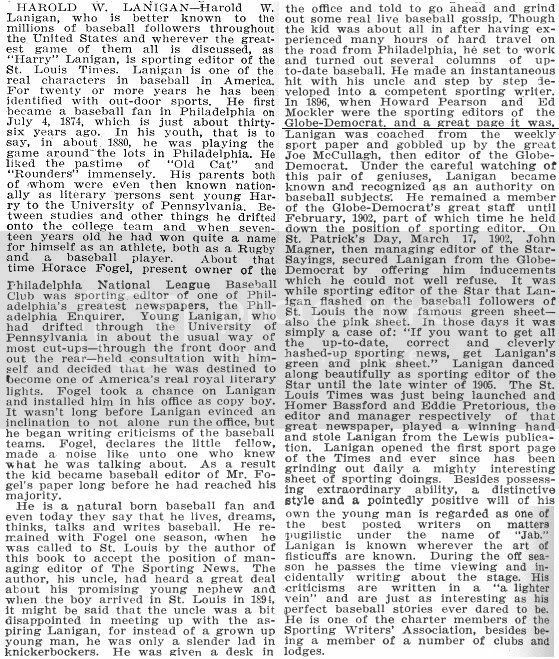 In reviewing Rockne, Caswell Adams reported that Brown probably knew the legendary Notre Dame football coach "more intimately than any other newspaper man. Similarly, in his later books on Chicago's baseball teams, Brown added an entertaining style to a foundation of facts. 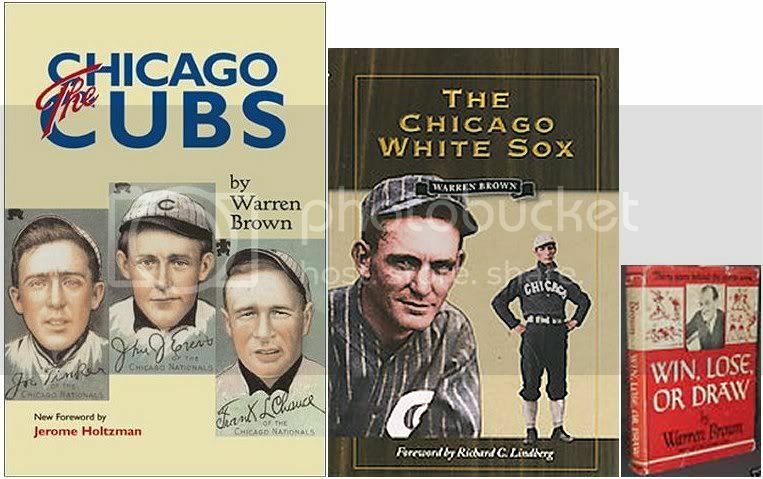 "Brown has done an exhaustive job of research and brightened the resulting text with a leavening of anecdotes," wrote Robert Cromie in his review of The Chicago White Sox. 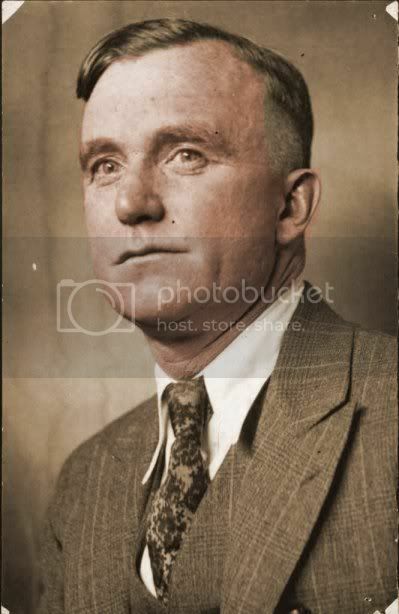 Brown died in 1978, at the age of eighty-six. 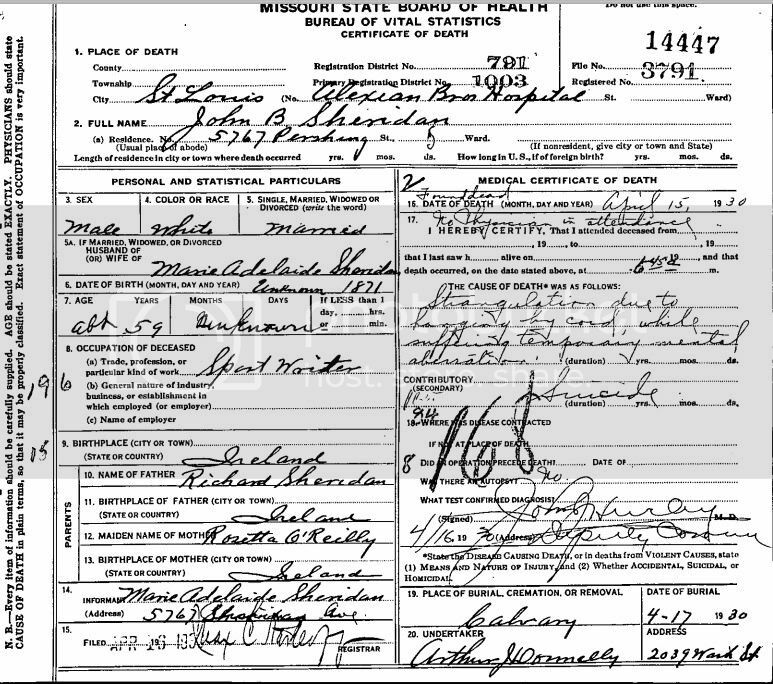 PERSONAL INFORMATION: Born January 3, 1894, in CA; died, November 19, 1978, in Forest Park, IL; son of Patrick and Hanore (Boyle) Brown; married Mary Olive Burns, August 23, 1919; children: Bill, Roger, Mary Elizabeth Brown Rempe. Education: Received degree from University of San Francisco. Military/Wartime Service: Member of Coast Artillery Corps and Corps Intelligence, World War I. AWARDS: Named Chicago's "Number One" citizen by Mayor Richard Daley, 1964; J. G. Taylor Spink Award, Baseball Writers' Association of America, 1973; named member of National Baseball Hall of Fame, 1974. CAREER: Played minor league baseball in Pacific Coast League, 1914; worked as sportswriter in San Francisco, CA, for the San Francisco Bulletin, San Francisco Call- Post, and San Francisco Call-Bulletin, beginning 1915; public relations manager for boxer Jack Dempsey, 1921; San Francisco Call-Post, sports editor, 1922; New York Evening Mail, New York, NY, sports editor, 1922; New York Journal, sports reporter, 1923; Chicago Herald Examiner, sports writer, beginning 1923; writer for various Chicago newspapers throughout the 1930s, 1940s, and 1950s, including the Chicago Herald & Examiner, Herald-American, and Chicago Sun. Guest on radio programs. Rockne, Reilly & Lee (Chicago, IL), 1931. Warren's photo/entry in Who's Who in Major League Baseball, edited by Harold (Speed) Johnson, 1933, pp. 510. ----------------------------------------------------------------------------------------------------------------Sporting News' obituary, December 9, 1978, pp. 46, column 2. ----------------------------------------------------------------------------------------------------------------Sporting News' tribute piece, December 15, 1973, pp. 38, column 3. Chicago Tribune obituary, November 21, 1978, pp. B6. Last edited by Bill Burgess; 08-01-2012, 09:55 AM. Education; Milford Center & St. Mary's HS; Dayton University; Ohio State College (Columbus, OH). Chicago Consolidated Press, sports editor (1929-54). Returned Dayton, OH 1975. Lived Biltmore Hotel. Specialized in football writing during the season, and golf. Member: Sigma Delta Chi; Phi Kappa; secretary, National Golf Writers' Association. Father: Thomas; Mother: Catherine Morrisey. 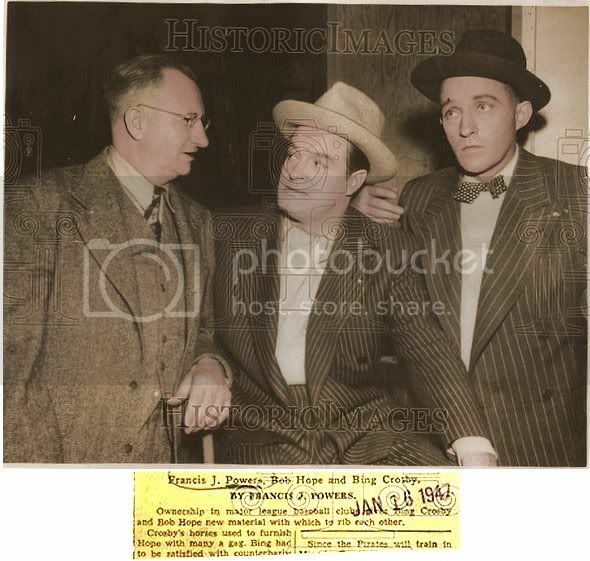 February 28, 1947: George Connor (Notre Dame tackle), Ed Krause (Notre Dame coach), Francis Powers. Presenting the Dr. John Outland award to Connor. 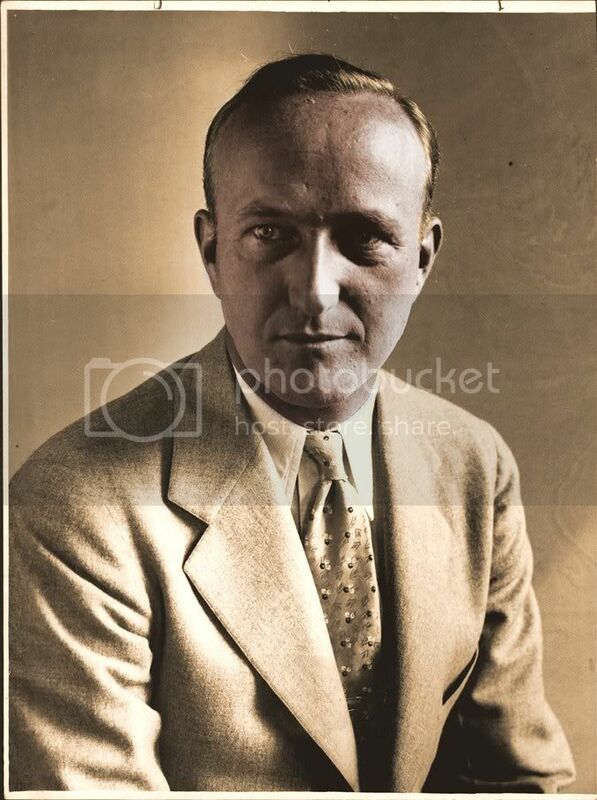 ------------------------------------------------------------------------------Francis' photo/entry in Who's Who in Major League Baseball, edited by Harold (Speed) Johnson, 1933, pp. 496. Dayton Daily News, September 4, 1977.--------------------------------------------------------------Frank Leahy. 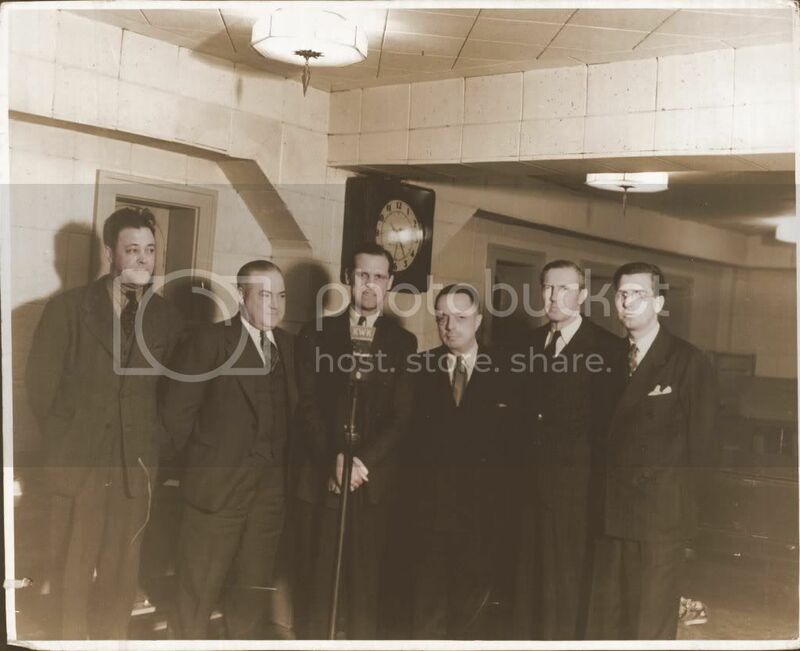 December 12, 1948: L-R: unidentified, Francis Powers, Bert McGrane, George Strohmeyer, Johnny Lujack.---January 16, 1947: Francis Powers, Bob Hope, Bing Crosby. ---------------------------------January 6, 1950--------------------------------------------------------------------February 22, 1950. -----------------------------------------------------------------------------------------------Wrote article on Pop Warner. Last edited by Bill Burgess; 07-22-2012, 01:29 PM. Last edited by Bill Burgess; 07-20-2013, 11:26 AM. 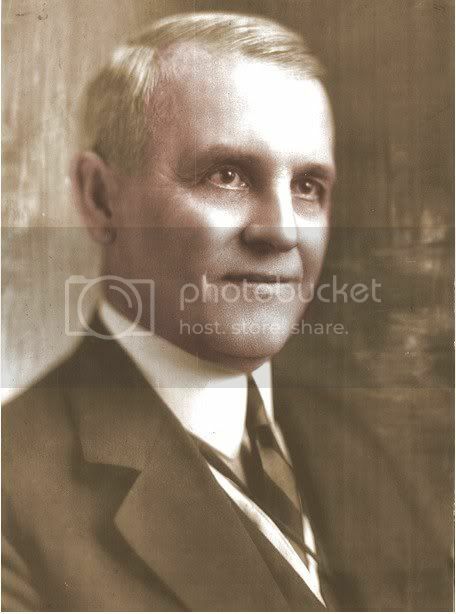 St. Louis Globe-Democrat sports writer, 1896 - 1908; sports editor, 1908 - 1921. After retiring, conducted weekly fishing/hunting column. An enthusiastic fisherman and hunter. Active in conservation. Last edited by Bill Burgess; 12-08-2011, 01:05 PM. Worked papers in Roanoke, VA, Key West, FL, Beaumont, TX. Liked Football & boxing, was expert. Father: George Oliver Greene, born December 21, 1870, Chesterfied, VA, died January 15, 1938; Mother: Emma, Martin, born Virginia, 1832? 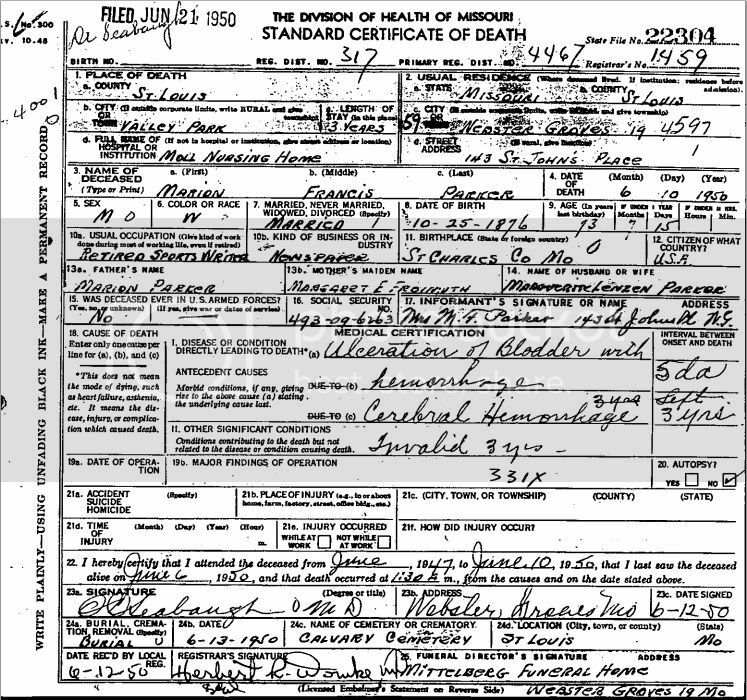 ; Wife: Kittie Karr; Son: 'Doc' Edgar Carlton Greene, born Beaumont, Texas, June 20, 1920, died August 11, 1970, Detroit, MI. Son Edgar was a featured columnist/sports editor for the Detroit News. Son was with the Detroit News from 1956, promoted to sports editor, November, 1963. -------------------------------------------------------------------------------------------September 14, 1963, pp. 40, column 3. Sam's photo/entry in Who's Who in Major League Baseball, edited by Harold (Speed) Johnson, 1933, pp. 510. Last edited by Bill Burgess; 10-18-2013, 06:26 PM. 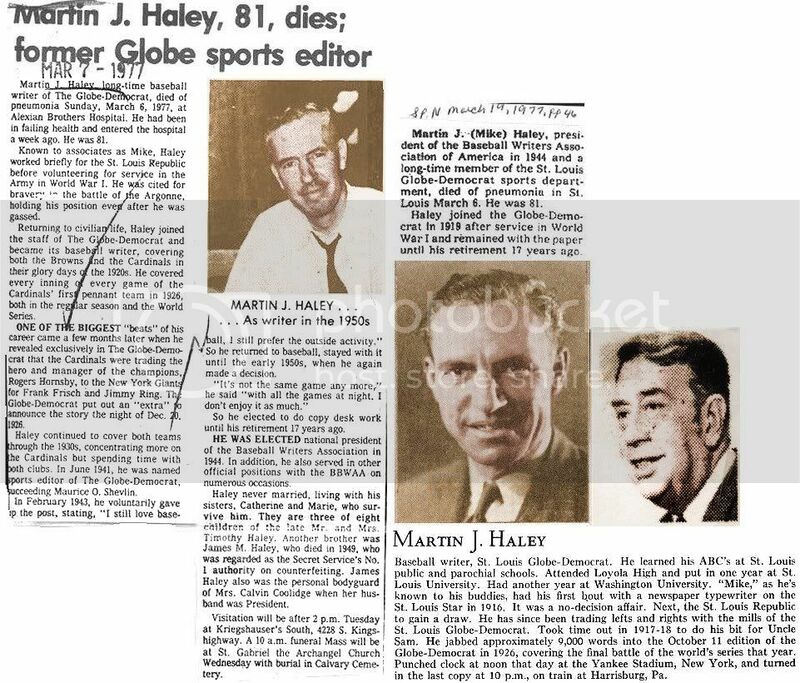 St. Louis Globe-Democrat sports writer, 1919 - 1941, 1943 - early 1950's) covered Cardinals & Browns, sports editor, 1941 - 1943, (early 1950's - 1960, copy desk work). Father: Timothy, born February, 1855, Ireland; Mother: Margaret Duffy, born October, 1860, Ireland. .---------------------------------------------------------------------March 19, 1977, pp. 46, column 5. ----------------------------------------------------------------------edited by Harold (Speed) Johnson, 1933, pp. 509. 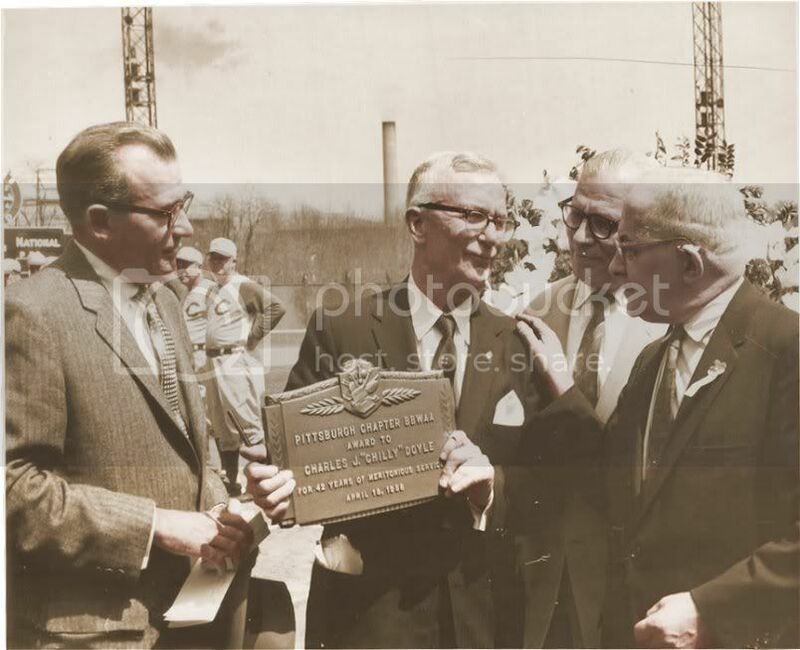 January, 1939: Hub Pruett, Donald Barnes (St. Louis Browns' owner), George Sisler, Taylor Spink, Mike Haley, Ray Schmidt. Last edited by Bill Burgess; 07-24-2012, 09:07 AM.